Today, we’re going to take a look at what Conversion Marketing is, why it’s important, and some practical steps you can take to put a process together to shift your organization or department into this much more tightly focused branch of marketing. To help define what exactly ‘Conversion Marketing’ is I like to use a simple and effective metaphor. Imagine that your website is a car. At the heart of that car is your engine – Conversion Marketing. This is the thing that provides power and makes your website ‘go’ in marketing terms. Everything happens on your site that meets one of your bottom line business goals is going to be because of your ‘engine’, or how well your Conversion Marketing Strategy is laid out. Conversion rate optimization is a process of improvement and, for lack of a better term, maintenance. Your CRO Specialist is going to be your mechanic. This person will understand how your strategy is laid out and be able to help you tune your engine to make sure it’s performing optimally. He or she will have an understanding of the process it takes to make improvements and will have at least some knowledge about how your entire marketing strategy is structured. Why is Conversion Marketing Important? If your site does not fall within one of these two categories and your digital marketing strategy is not focused on conversions, then what is it focused on? Why? Some marketers and business owners out there may have just got a cold chill of realization down their spine. Don’t worry. It’s never too late to revamp your marketing strategy. How can I get started with a conversion marketing strategy? There are two questions you need to ask yourself if you want to get started with building out a new marketing strategy built around conversions. Question 1 – What are my bottom line business goals? Business goals are the things that have real dollar amounts tied to them. These are the things that your onsite KPIs (key performance indicators) will be linked to, but they should not be confused for KPIs themselves. Business goal – Off-load lingering product in the warehouse to make room for more valuable inventory. KPI attached to that business goal – Increase the number of conversions on my clearance category. Question 2 – What are the on-site KPIs that will help you achieve your business goals? Your KPIs should already be tied to a measurable change in a bottom line business item. This is the only way to make sure that you have a real, measurable KPI that you can build around. If you have not set KPIs for your site then this is something you need to do right now. You cannot build an effective conversion marketing strategy without KPIs and at least a basic understanding of how the different parts of your site are helping you achieve your actual business goals. Remember – your KPIs need to be clearly defined, measurable, and tied to a business goal. If you aren’t sure if your KPIs are accurate don’t worry – you will figure out what works best for you as you work. This process will help get you started. The KPIs that will be most important to your business will be the ones that are tied to your highest value business goals. For most businesses, these KPIs will be sales or lead oriented. Once you have your business goals and KPIs defined, take a few moments to rank them. You can use a spreadsheet for this (Excel or Google Sheets work equally well for this). Once you have this list built you can use the ‘Tactics’ column to figure out what tools you will need in order to execute on those items. There are some tools that will allow you to do two of these things, but Justuno enables you to execute on all three of these. Here are just some of the ways in which you can use Justuno for these three incredibly valuable tactics to get you started on building your conversion marketing strategy. 1. Build your email capture form in Justuno by either integrating with your ESP or importing custom HTML. Then use our design canvas to style. Keep an eye on the number of engagements and use the A/B testing tool to test variations in call-to-action, discount amounts, or general promotional copy. 2. Cart abandonment accounts for tens of billions of dollars in lost revenue for e-commerce businesses. If you don’t have a way to stop a visitor from leaving your cart by giving them a reason to buy right then and there, you are letting money walk out the door. Build your cart abandoner entirely within Justuno or use one of our pre-built themes! 3. There are many ways to increase AOV, but perhaps the easiest is to offer free shipping on minimum order value. Use a banner to show this information across your entire site to maximize exposure. Convert More Today with Justuno! Make conversion marketing a focus for your business today. 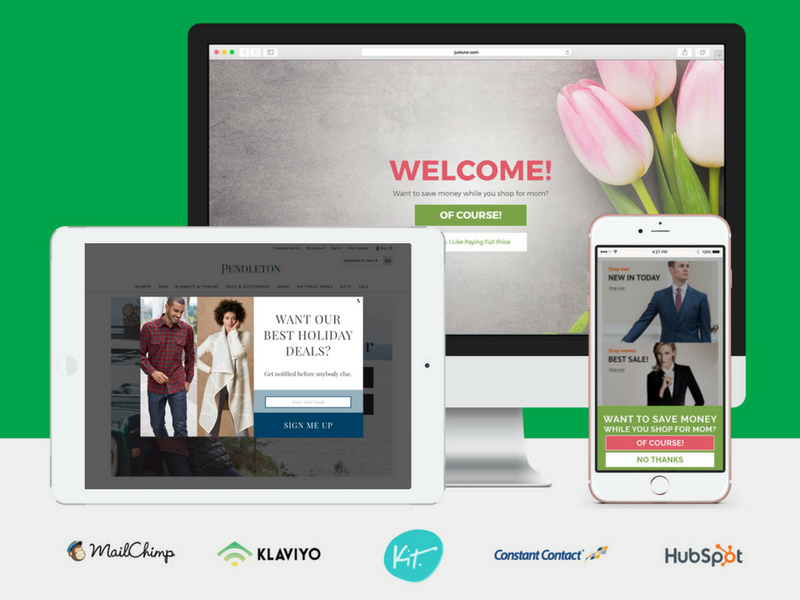 Get started with a free Justuno account and access over 20 conversion focused apps that are completely customizable to your businesses needs. Hit the button below and get going!